- Dean coming back so quickly has to be a trick, right? I mean, Michael said explicitly that he was setting up a trap for Sam et al, but it seemed like the trap at first was just going to be throwing a bunch of super werewolves at them. - Even if this is a trap, is Michael hiding somewhere in Dean, or did he hop to another vessel? It seems like Michael wouldn't want to completely leave Dean, because wouldn't he need permission to get back in again? - So Nick/Lucifer's former vessel is still around, and apparently he murdered his neighbor with a hammer? The way the episode was going, I kept thinking we would find out either that Lucifer or something supernatural had killed his family or that Nick had done it himself. - I guess it makes sense that no one other than Team Free Will would be aware that Kelly was dead. Still it seems kind of awful to just leave her parents unaware that she died. Although I suppose that would also raise a lot of questions that would need to be answered, like, who is taking care of them. Also, she was sleeping with POTUS, so it seems a little weird that they would just allow her to completely drop off the radar like that. Dean coming back so quickly has to be a trick, right? So Nick/Lucifer's former vessel is still around, and apparently he murdered his neighbor with a hammer? The way the episode was going, I kept thinking we would find out either that Lucifer or something supernatural had killed his family or that Nick had done it himself. I kinda thought that was the implication of the ending there? He had clearly murdered the neighbor with a claw hammer, which is the same weapon his family was murdered with. Also, she was sleeping with POTUS, so it seems a little weird that they would just allow her to completely drop off the radar like that. I assume this is why they can get away with claiming Kelly's still alive - most likely the federal government is also covering up Kelly's death. They just have to play along until some time down the road when the Feds announce that Kelly tragically died in a plane crash doing [classified government work]. You see, that's the scene I'm not sure how to read. With the neighbor changing his story, I wasn't sure if A) it's because no one ran from the house because Nick did it himself or B) maybe the neighbor saw Nick leaving the house but got freaked out and recanted or Lucifer as Nick threatened him or C) the neighbor made up the story about seeing a man run from the house because the neighbor killed Nick's family himself. If it's the latter case, then I thought the implication of the scene was that Nick used the same murder weapon as revenge for what happened to his family. I really feel like you could read it either way: A continuation of Nick's MO as a murderer or revenge by recreating the original crime. Although honestly the whole Nick being alive thing really bothers me. Aside from the fact that I'm just kind of tired of Mark Pellegrino on the show after all the time spent on Lucifer (and the show going back and forth on whether he could be redeemed until the final episode), it just doesn't really make sense that Nick is alive. Castiel told Clair at one point that Jimmy Novak is no longer sharing the vessel because basically humans can't handle being killed and brought back (after Lucifer vaporized Castiel while he was wearing Jimmy). I would think that after all the crap Crowley did to make Nick's meat suit into Lucifer's permanent vessel and also his new prison, could human Nick still be lurking in there? And even if he was, shouldn't he be comatose/absolutely crazy/brain dead/whatever? We saw what happened to Raphael's vessel back in S4 or S5. Of course, Castiel said that was also what Dean had to look forward to if he said yes to Michael, and obviously the show can't have that happen, so I guess we're just going to ignore all that textual evidence. This one was interesting, because it leaned hard into quiet dialogue scenes and made that work pretty well. Jack came across as a real sweetie, as always... until he started talking about killing off Dean. That seemed a little out of character for him, but at the same time I can see how they don't want him to just be nice ALL the time. I suspect Dean is really Dean. I think they were just that desperate to get the character back. 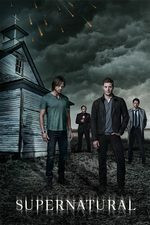 It would be neat to have a whole season with evil Jensen Ackles, but he is kind of the lead and you don't write out your Buffy or your Fox Mulder if you can help it. Now, Dean may not be fully purged of Michael, or maybe they'll pull a twist where they make us think he's Dean and then in a few episodes we find out it was a ruse. But I think Michael has probably jumped hosts and Dean is back. I didn't get the feeling the neighbor was the killer. I got the feeling Nick killed his family but I'm not sure if the neighbor saw him leave the house. The neighbor's whole deal was weird. It was weird how he'd changed his story and he acted shifty about it, but if he thought Nick did it, why would he let Nick in at all? Early on the neighbor was acting very calm and gentle, I actually thought he was a therapist or something. He wasn't acting as terrified as you'd expect, if he thought Nick was a killer. That moment where Nick went all Lucifer-ish with Castiel and then pretended(?) he didn't remember it might mean that Lucifer is in there messing with his mind, making Nick think he killed his family and even making him kill that neighbor. Or maybe "Nick" IS Lucifer, and he just thinks he's Nick? Kelly's parents seem like nice folks who were amazingly cool with having no idea where she is or what she's doing or what's going on with their grandchild. I'm not saying some totally functional families couldn't be like that, but it was hard not to imagine them feeling hurt on some level by (as far as they know) being cut so totally out of their daughter's life. I'm not sure what to make of the Dean thing. I have a hard time believing that that's the sum total of the Dean-possessed-by-Michael plot, but who knows with this show. If Michael is playing out some big plan to trap the Winchesters, I'm not sure why he needed one as elaborate as leaving the vampire alive as bait and making a deal with the superwolves. It makes sense that he'd understand how suspicious it looks for Dean to just walk up to his family being like "yeah no I'm good now, angels amirite", I'm just not sure how all the other stuff makes that seem more plausible. And adding to that, such a big deal has been made over the course of the show about Dean being the Michael sword/Michael's true vessel/whatever, that I have a hard time believing he would give up possession of that vessel, even as a part of a larger scheme. I mean, is he really that concerned about the Winchester crew interfering with him? We saw in S4 or whatever that before Crowley made Nick into the perfect Lucifer vessel, Nick was literally falling apart under the strain of having Lucifer possess him. Angels also made a big deal about what a strong vessel Jimmy Novak is. It just seems like he wouldn't want to give up his perfect vessel that easily. At the same time, presumably Castiel would be able to sense if Michael is hiding in Dean somewhere, right? And Michael would have to know Team Free Will isn't stupid enough not to check that it is in fact Dean in there (at least, I hope they aren't that stupid). I think Michael is still inside Dean. But I don't think that was part of his trap plan. If his goal was just to reunite Dean (plus hidden Michael) with Team Free Will he wouldn't need an elaborate trap; Dean could just show up at the bunker. If for some reason Michael wanted Team Free Will to know about how he's making an army of super monsters, he wouldn't need to lure them to Duluth and set things up so they would hopefully discover the truth; he could just call them up and tell them what he was doing. What makes more sense is that his plan was simply to get Team Free Will in a place where he could have them killed and that hiding inside Dean is a hastily-concocted Plan B he came up with when Plan A failed. You would think Cas would be able to tell Michael is in there, but the writers get to make up the rules as they go, so they can easily make it true that archangels (perhaps unknown to Cas) have the ability to hide themselves undetectably inside their vessels. Of course this would leave open the possibility that Lucifer, or some limited version of him, is still hiding inside Nick. It's looking like Nick may be an evil person who killed his family before he was possessed. Maybe everyone will conclude that's true but eventually it will turn out that he's actually a decent guy who is still possessed. Maybe discovering that will clue everyone in that Michael could still be inside Dean. Or maybe discovering that Michael is still inside Dean will make them realize that Lucifer might not be completely gone either. I also like the idea that Nick could be Lucifer without even realizing it. Yeah there's so many possibilities of what's happening that I'm not even going to try to speculate. The whole thing with Jack and the grandparents was really sweet and heartbreaking. I feel so bad for them. WRT Raphael's host vs Nick, I can imagine that an archangel leaving an unsuitable host is different from leaving a suitable one or being killed with the archangel blade. Otherwise John would've been catatonic in the past when Michael possessed him. Perhaps Cas forgot that briefly.